You may rent an Ogden or Troubadour lever harp, $39-$49/month + initial shipping cost. Local rental may be available, contact me directly about this. You commit to renting a harp for 6 months, and at the end of that time you have the option to return the instrument or purchase it. If you choose to purchase, the rental fees you have already paid will be applied to the purchase price. 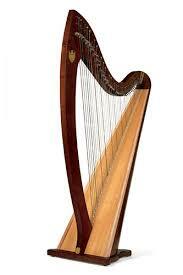 This option is only available on certain models of harps. 3. Bounty Program: Lyon & Healy will apply the original purchase price of any Lyon & Healy lever harp or Chicago Petite 40 pedal harp that is less than five years old, in fair condition, and traded in by the original owner, toward the purchase of any new Lyon & Healy pedal harp of greater value. Tying the knot with an anchor (1st, 2nd, and 3rd octaves). Master harp maker Allan Shiers of Teifi Harps guides you through the process of tying a knot in a harp string. Winding the string around the tuning pin.